The company's business may be better in 2017, but its stock valuation looks too optimistic. If I were to tell you that a company failed to make a major acquisition and then had to shell out $3.5 billion as a breakup fee, I'm guessing that you wouldn't think the company's stock would do well in that given year. That wasn't the case for Halliburton (NYSE:HAL), though, as it was able to post a staggering 58.9% gain in 2016 despite its failed attempt to acquire fellow oil services company Baker Hughes. From an investor perspective, this looks great. It's a company re-emerging from the lowest of the lows of a commodity cycle that has also shaken off the demons of this most recent acquisition blunder. All of this would seem to suggest that shares of Halliburton might have another fantastic run in them for 2017 as well. Before you jump on the Halliburton bandwagon, though, there are some reasons to give investors pause. 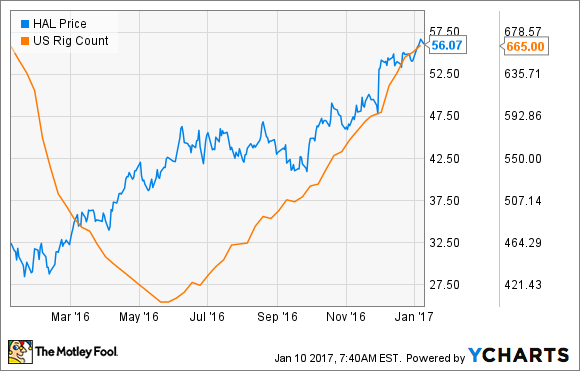 Let's take a look at why the market fell in love with Halliburton's stock in 2016 and why a repeat performance may not be in the wings. In the midst of this incredible oil market crash over the past two and a half years, there was a large shift in the way that companies in this industry think about oil and gas production. Production from shale, which was one of the most expensive sources less than five years ago, has fallen so far down the cost curve that it is now cost competitive with just about every other oil source out there. The best way to explain this is with these two charts from EOG Resources (NYSE:EOG). This first one from 2015 shows the after-tax rate of returns (ATROR) for the creme de la creme of its land holdings. At $55 per barrel in 2015, it was generating better returns than at $95 per barrel in 2012. Fast-forward to today: EOG is now saying that the after-tax rate of returns at $50 a barrel across its entire portfolio are better than 2015's return rates on its prime acreage. Now to be clear, EOG is one of the better producers in the country and not every producer is seeing the same level of success. What it does highlight, though, is how astoundingly fast shale has become cost competitive at oil prices that are half what they were five years ago. This also means that there has been a monumental shift in how producers approach their capital allocation decisions. Even the integrated majors Chevron and ExxonMobil -- companies with extensive options for where to spend their money -- are electing to focus on shale development over the next few years. This plays almost perfectly into the hands of Halliburton. Of the large oil services companies, it is most closely tied to the North American market and will likely see the largest revenue gains from increased shale activity compared to its peers. So as we saw the active rig count across the U.S. improve in the second half of 2016, it has pulled Halliburton's stock up with it. The idea that American shale is going to come roaring back is enough to give Halliburton investors hope that better days are ahead. Based on the recent rally and its current valuation, though, one wonders if Halliburton's stock is overvalued. Here are a few things to consider. The first is that we're not getting back to 2014 anytime soon. Yes, drilling activity is expected to increase throughout 2017 as shale is likely going to be a key source for meeting demand growth. At the same time, though, producers have become much more proficient at drilling and therefore don't need to drill as many wells to get similar results. So the chances of returning to pre-crash levels of drilling activity aren't that great. The other thing to consider is that service contract rates have declined significantly. Halliburton and many other oil service companies have said on their conference calls that they made some very large pricing concessions to producers to help them keep the lights on in recent years. Those same management teams have said that they plan to hold the line on only pursuing work that generates returns in the future. With so much excess oil and gas drilling equipment available, though, they may not be able to attain pre-crash contract rates. Additionally, Halliburton's stock valuation is starting to look out of whack. Today, shares trade at a price-to-tangible-book-value ratio of 6.6. The last time shares traded at a valuation this frothy was in 2007, when everyone was losing their minds about peak oil. 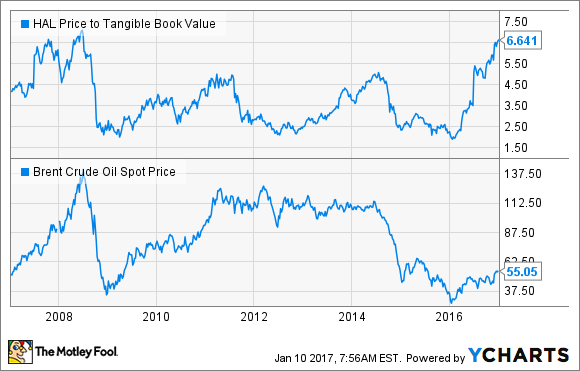 HAL Price to Tangible Book Value data by YCharts. It would seem that Wall Street has gotten a little ahead of itself with Halliburton's stock. Sure, the company will likely see a decent uptick in revenue and earnings in 2017, but it's hard to see it growing enough to justify paying 6.6 times tangible book value today. Investors shouldn't be surprised if shares of Halliburton come back to earth in 2017. The long-term prospects look promising enough that current Halliburton shareholders shouldn't worry too much, but those looking at this stock for the first time should probably steer clear of a valuation this high.